Describe the Scientific Revolution and its effects. Nicolaus Copernicus developed heliocentric theory. Johannes Kepler discovered planetary motion. Galileo Galilei used telescope to support heliocentric theory. Isaac Newton formulated law of gravity. William Harvey discovered circulation of the blood. Explaining the political, religious, and social ideas of the Enlightenment and the ways in which they influenced the founders of the United States. Thomas Hobbes’ Leviathan: Humans exist in a primitive “state of nature” and consent to government for self-protection. John Locke’s Two Treatises on Government: People are sovereign and consent to government for protection of natural rights to life, liberty, and property. Montesquieu’s The Spirit of Laws: The best form of government includes a separation of powers. Jean-Jacques Rousseau’s The Social Contract: Government is a contract between rulers and the people. Voltaire: Religious toleration should triumph over religious fanaticism; separation of church and state. Political philosophies of the Enlightenment fueled revolution in the Americas and France. 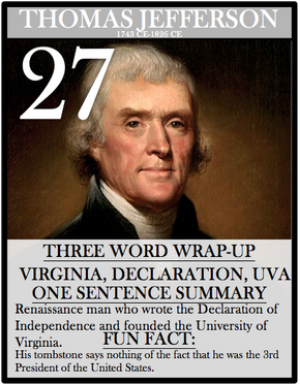 Thomas Jefferson’s Declaration of Independence incorporated Enlightenment ideas. Describe the expansion of the arts, philosophy, literature, and new technology. Painting depicted classical subjects, public events, natural scenes, and living people (portraits). New forms of literature evolved, such as the novel (e.g., Cervantes’ Don Quixote). All-weather roads improved year- round transport and trade. New designs in farm tools increased productivity (agricultural revolution). Improvements in ship design lowered the cost of transport.